If you are aspiring to pursue your passion to act, direct, produce, write, sing, or design sets on the big stage, then it is important to realize that there are many organizations delivering scholarships for theatre majors to make these dreams a reality. Contrary to popular belief, theatre can become much more than just a hobby and lead to an exciting career in the entertainment industry. Although the process of landing a theatre gig can be incredibly grueling and careers in theatre are rarely associated with an immediate financial upside, theatre majors usually choose this field based on an overwhelming passion for the art form. Luckily, the following are 25 of the best scholarships that provide the financial backing needed for theatre majors to make their way into the limelight. Annually, the American Theatre Organ Society Scholarship Program is open to amateur young organists between the ages of 13 and 27 who are studying with a professional theatre organ teacher and regularly perform on the theatre organ for pay before the general public. In order to qualify for up to $1,500, theatre organ students must be nominated by a professional member, submit an essay, and agree to appear as a featured young organist at any ATOS convention. Named in honor of South Carolina’s first poet laureate, the Archibald Rutledge Scholarship for the Arts is granted annually for $2,000 to graduating high school seniors who will be attending a college or university within South Carolina to major in one of the five arts disciplines, including creative writing, dance, music, theatre, or visual arts. Qualified theatre students must submit an original one-act play with a performance time ranging between ten and fifteen minutes. Through the Educational Theatre Association, the Bob and Marti Fowler Future Theatre Educator Scholarship is awarded for $1,000 annually to an outstanding college student who is pursuing a theatre degree at an approved U.S. institution full-time. Recipients must demonstrate leadership abilities, strong moral character, academic promise, organizational skills, experience in different aspects of theatre, and an excellent work ethic for being a member of a theatre production team. At the University of Wisconsin at Milwaukee, the Peck School of the Arts offers the Cynthia Poulson Memorial Theatre Scholarship for $1,000 and a one-year subscription to the New York Times to a currently enrolled full-time undergraduate theatre major with freshman, sophomore, or junior-level standing. Eligible candidates must show high achievement with a minimum cumulative GPA of 3.5 or higher and be exceptionally active in serving the department. Each year, the Disney Diversity Theatre Arts Scholarship is offered to first-year full-time undergraduate minority theatre majors at the University of Central Florida who are pursuing a Bachelor of Fine Arts (BFA) in Theatre Studies, Stage Management, Musical Theatre, or Acting. Qualified candidates should be committed to pursuing a professional career in theatre, have a minimum cumulative GPA of 3.0 or higher, and document active involvement in theatre productions. In partnership with the Legacy Foundation, the Northwest Indiana Excellence in Theatre Foundation has established the D.J. and Rose Nidetz Scholarship to provide $1,000 to residents of Lake, Porter, and LaPorte counties who can provide proof of having worked in or on a production with one of the foundation’s member theatres. Applicants must be accepted for enrollment in an undergraduate degree program with a major in performing arts, theatrical design, dramatic arts, fine arts, music, or theatre arts. Within the Department of Theatre Arts at Ithaca College, the Florence Marro Gallagher Memorial Scholarship is presented annually for $1,500 to a full-time deserving and committed undergraduate student who has declared a major in acting, drama, musical theatre, theatre arts management, or theatrical production arts. Preference will be given to students who demonstrate financial need, have a cumulative GPA of 3.0 or higher, and are actively involved in professional development activities. Sponsored by the Pittsburgh Foundation, the Fox Chapel Area Education Scholarship Fund is available for graduating high school seniors in Pittsburgh who are interested in continuing their education with a major in the fine arts, including art, music, drama, communications, theatre, and/or dance. Eligible applicants will demonstrate financial need, be accepted into a two or four-year U.S. college, maintain a GPA of 3.0 or higher, and participate in art-related activities. Ranging in value from $1,000 to $3,000, the Grand Rapids Combined Theatre Scholarships are distributed through the Grand Rapids Community Foundation for theatre majors enrolled full-time in an accredited college or training program who have experience in any of the Grand Rapids area community theatre venues. Applicants must attach a current resume, three current letters of recommendation, and a two-page essay on short and long-term theatre career goals. At the University of Iowa, the Hatch-Billops Theatre Arts Scholarship Fund awards up to $1,300 annually to theatre majors of African American or Caribbean descent, with preference given to descendents of the Middle Passage who were born in the United States or Caribbean. Candidates must be pursuing a B.A. in Theatre Arts, exhibit talent and ambition in one or more areas of theatre production, and maintain a minimum cumulative GPA of 3.0 or greater. Annually, Hope College offers up to sixty Distinguished Artist Award (DAA) scholarships for $2,500 towards tuition costs to incoming and returning students with strong academic records as well as outstanding creative abilities in art, dance, music, creative writing, or theatre. While theatre majors must complete an audition and/or design-technical portfolio presentation, students unable to attend on-campus auditions can contact the department for setting up an alternative audition date or videotaped audition. With the goal of recognizing, honoring, and providing financial assistance to outstanding student performers wishing to pursue further education in the theatre arts, the Kennedy Center offers the Irene Ryan Acting Scholarship for $2,500 to actors who advance to the final round of competition in the annual national festival in Washington, D.C. Auditions will be evaluated based on the ability to make bold acting choices, mastery of an expressive vocal and physical instrument, clear understanding of text, facility with language, and demonstration of range. Established in 1973 by the Screen Actors Guild Foundation in honor of its long-time Executive Secretary who pioneered a series of concessions from major movie studios to increase compensation for working actors, the John L. Dales Scholarship Competition has awarded more than $6 million dollars to more than 1,632 members for study in higher education. Recipients must be experienced members who need further education in theatre at a U.S. accredited university, college, junior college, or trade/vocational school. Administered through the American Psychological Association (APA), the Joseph Collins Foundation Scholarship awards up to $10,000 per year to medical students in their second, third, or fourth year who are in the top half of their class and intend to specialize in neurology, psychiatry, or general practice. Candidates must demonstrate interest in cultural and theatre pursuits outside of medicine, exhibit financial need, and give evidence of good moral character. The Las Casas Performing Arts Scholarship Program is designed to award up to $5,000 in financial assistance to deserving college-bound graduating high school seniors who are seeking to further their education and experience in the disciplines of theatre acting, musical theatre singing, and/or dancing. Qualified applicants must be naturalized U.S. citizens, be residents of Texas, be accepted into an accredited four-year institution, and submit two 500-word essays. Created by the Georgia Thespians Theatre Association in honor of a legendary director, teacher, and friend to actors throughout the state, the Linda P. Wise Theatrical Performance Scholarship will grant $2,000 annually to a student member who will be pursuing a theatre major at an accredited state institution full-time. Applicants must demonstrate outstanding talent through the audition and the outline resume of roles performed through their high school years. Sponsored by the Illinois state chapter of the Delta Kappa Gamma Society International, the M. Josephine O’Neil Arts Award Scholarship offers up to $6,000 to female Illinois residents who are currently enrolled in their sophomore or junior year at an accredited four-year college or university with a major in music, visual arts, dance, or theatre arts. Applicants must submit an official college transcript, two letters of recommendation, a personal essay on achievements in the arts, and at least one sample of their artistic work. As an affiliate of the Educational Theatre Association, the Oregon Thespians present the Melba Day Sparks Memorial Scholarship to current graduating high school seniors in the state who have been inducted into the International Thespian Society and are planning to continue their theatre-related education at the university level. Applicants must have declared a major in theatre, be in good standing with their troupe, and have a minimum cumulative GPA of 3.0. 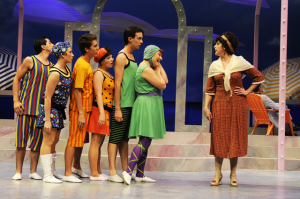 Administered through the Greater Kansas City Community Foundation, the New Theatre Guild Scholarship Endowment Fund has been created to provide annual awards for both undergraduate and graduate students who will be majoring in theatre at the University of Kansas, University of Central Missouri, or University of Missouri. Candidates must be accepted in an accredited theatrical arts program with good academic standing and financial need. At the annual conference each year, the Ohio Community Theatre Association presents a scholarship for up to $2,000 to a deserving student member or a child of a community theatre member who has been accepted into an accredited post-secondary program with a major related to the theatrical or performing arts. Candidates should submit a transcript, two letters of recommendation, and a one-page paper on future goals for involving theatre in their life. As a national program dedicated to assisting emerging theatre, dance, and film artists who are at the early stages of their professional careers, the Princess Grace Foundation Theatre Scholarships offer between $7,500 and $30,000 to outstanding students who are enrolled in a public or non-profit U.S. institution for studying theatre. Applicants must be U.S. citizens, be nominated by their school department dean, and demonstrate academic and artistic promise. Designed to ensure that those who excel in set design and technical production are not overlooked when it comes to financial support, the Rose Brand Scholarship Program provides up to $5,000 to undergraduate and graduate students who are seeking theatre careers by studying scenic design at an accredited U.S. university. Selection will be based on faculty recommendations, photographs/descriptions of projects, essay responses, and expected promise as a theatre professional. Created by the Theatre Association of New York State (TANYS) to honor a beloved professor who was instrumental in the local arts efforts for developing theatre degree programs, the Ruth R. Legg Memorial Theatre Arts Scholarship is granted for up to $2,500 annually to a current high school senior who has been active in community theatre. Applicants must be accepted as a theatre major/minor in an accredited U.S. university, be a New York State resident, and provide at least one letter of sponsorship. At the University of South Dakota, the Strollers Memorial Endowed Talent Scholarships are awarded annually for up to $2,000 to sophomore, junior, and senior-level undergraduate students who have demonstrated excellence in the performing arts with a major in theatre. Qualified applicants must be involved in theatre productions, maintain high academic standards, demonstrate good character, have financial need, and submit an art/technical portfolio. Within the California Educational Theatre Association (CETA), the Vivian “Bish” Edwards Memorial Scholarship is granted annually for $1,000 to a graduating high school senior from southern California who plans to major or minor in theatre at an accredited U.S. institution with the goal of becoming a theatre educator. Applicants must be dedicated theatre students, have a minimum cumulative GPA of 2.0 or higher, submit a 1,000-word essay on the role of theatre in their professional goals, and agree to participate in an interview. Beyond federal aid, it is strongly recommended that all theatre majors apply for as many scholarships as possible to help reduce the financial burden of rising tuition costs and minimize the amount of student loan debt that will need to be repaid with interest after graduation. Whether you are an actor, director, singer, playwright, designer, or member of the stage crew, be sure to check out these 25 great scholarships for theatre majors to take the lead in fostering your artistic talents and achieving your professional goals.